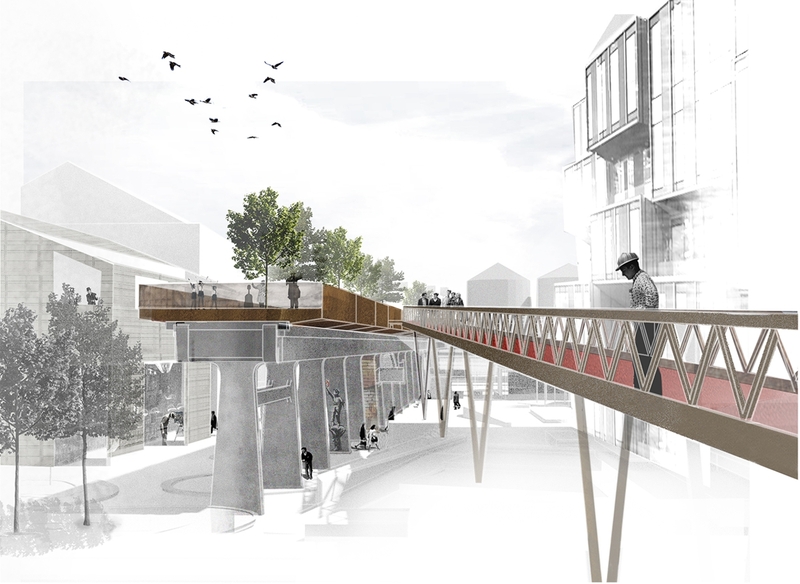 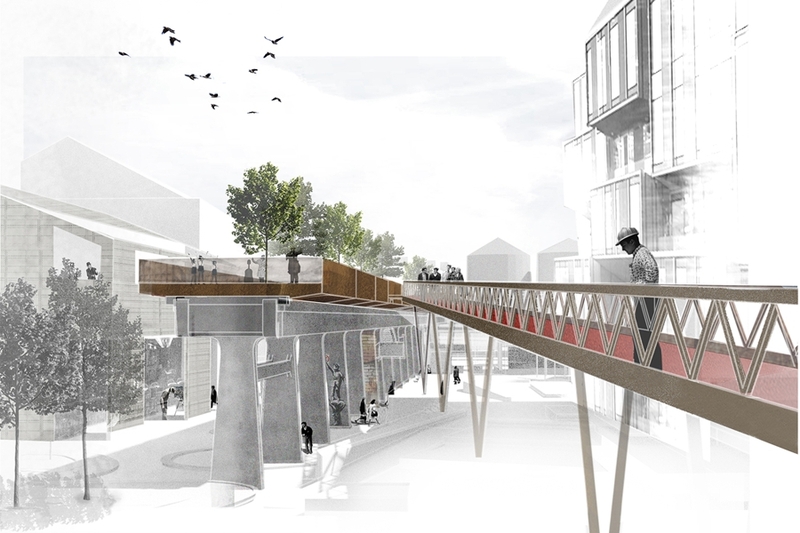 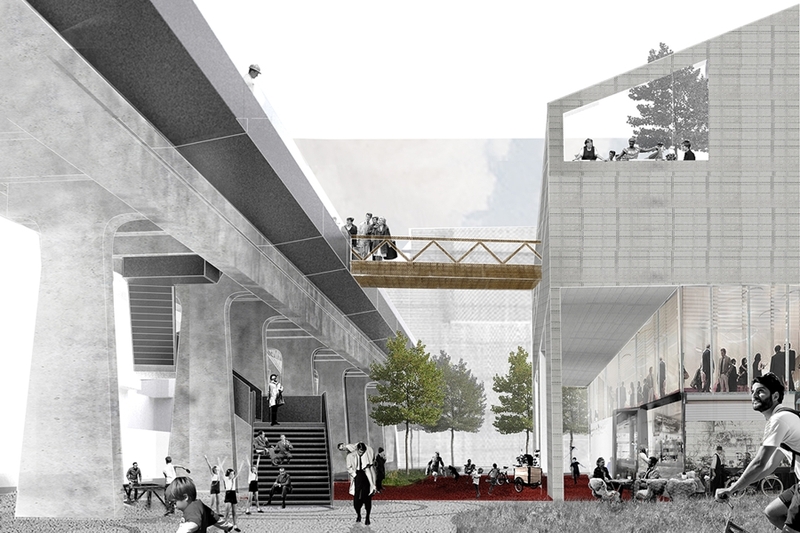 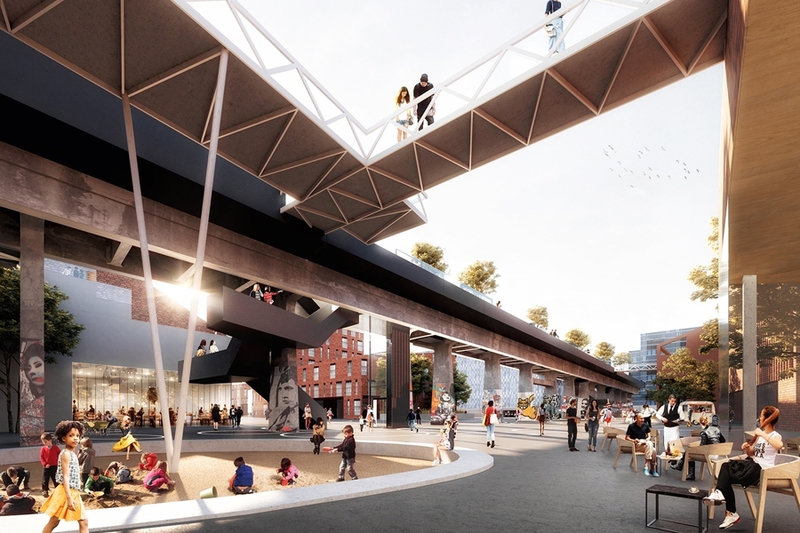 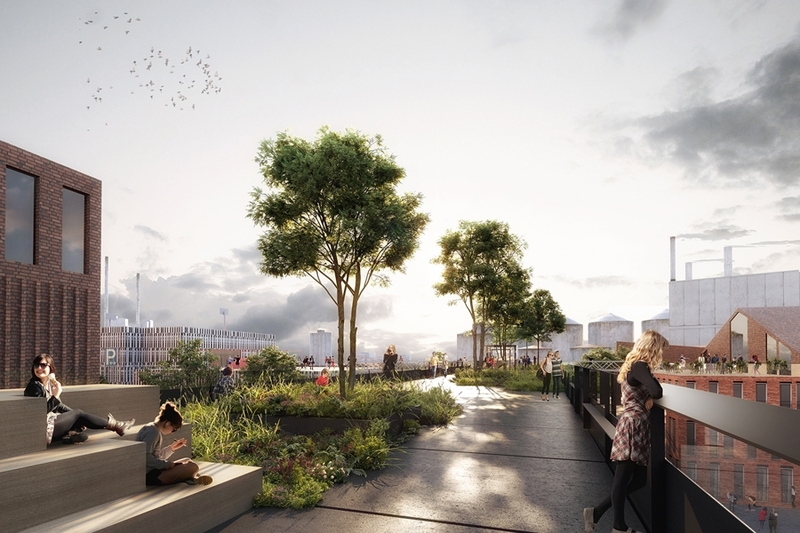 TERROIR together with LATZ & Partner and ISC Engineering came second in this international 3-stage competition for the redevelopment of the Sydhavn Precinct in Aarhus centred around the old Coal Bridge – a concrete beam that was actually a rail upon which a mobile crane moved coal back and forth across the site. 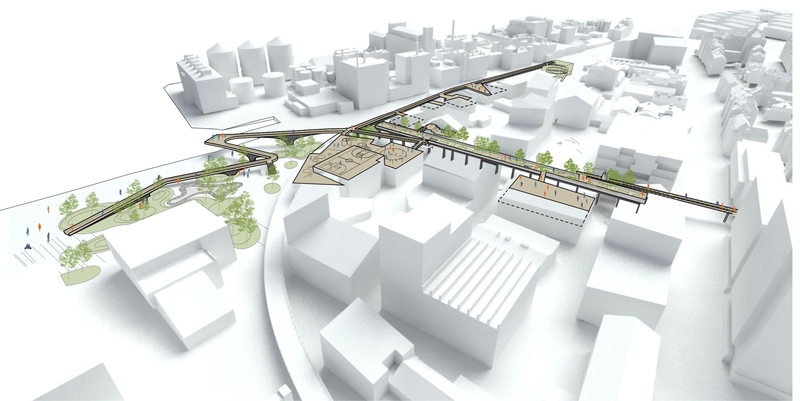 Despite the focus on the bridge, the project actually had to anticipate a 300,000sqm. 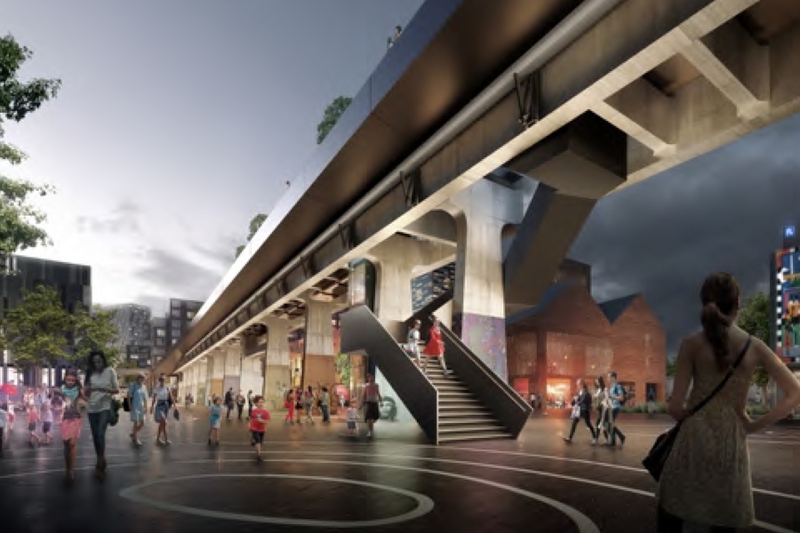 redevelopment of the precinct, film studios and start-up centre while maintaining its role as a hub for homeless people in the city. 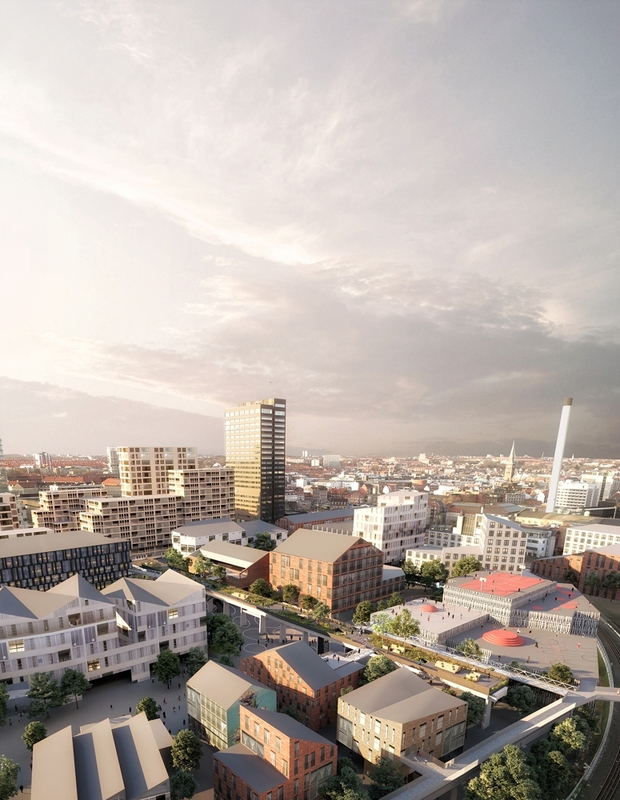 At the same time, the City had approved – paradoxically given the other proposed uses – the location of the new Danske Bank Headquarters adjacent to the bridge. 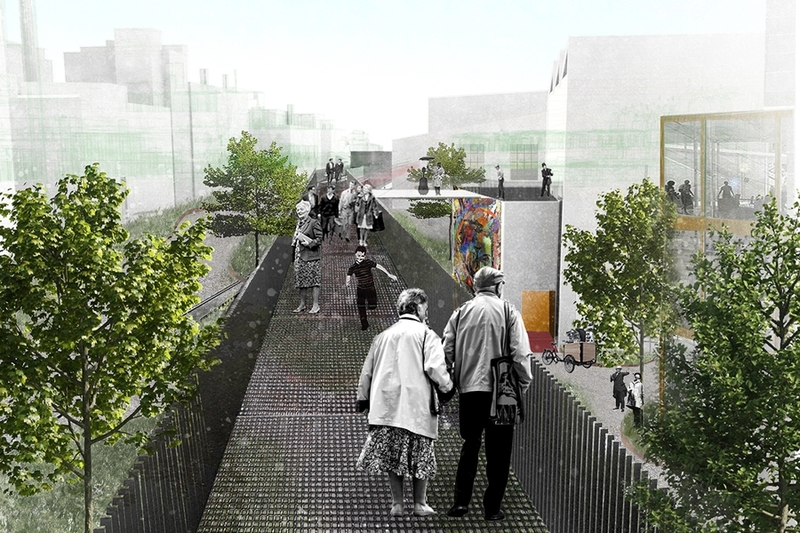 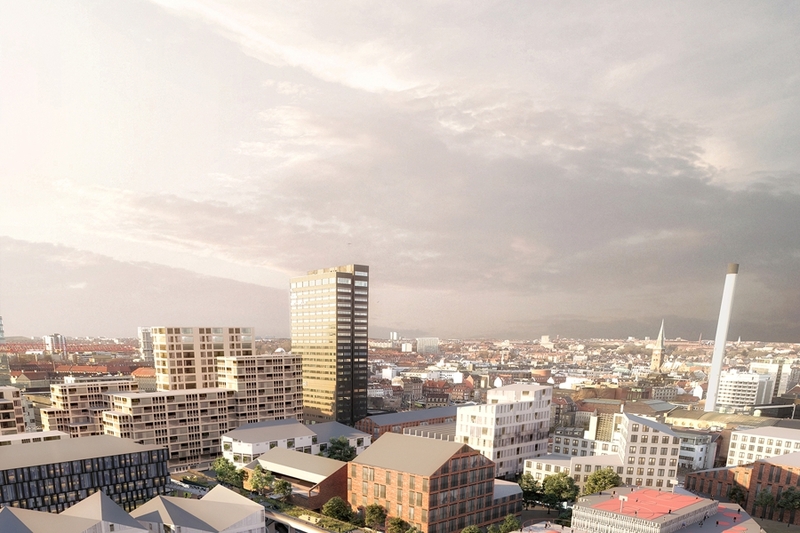 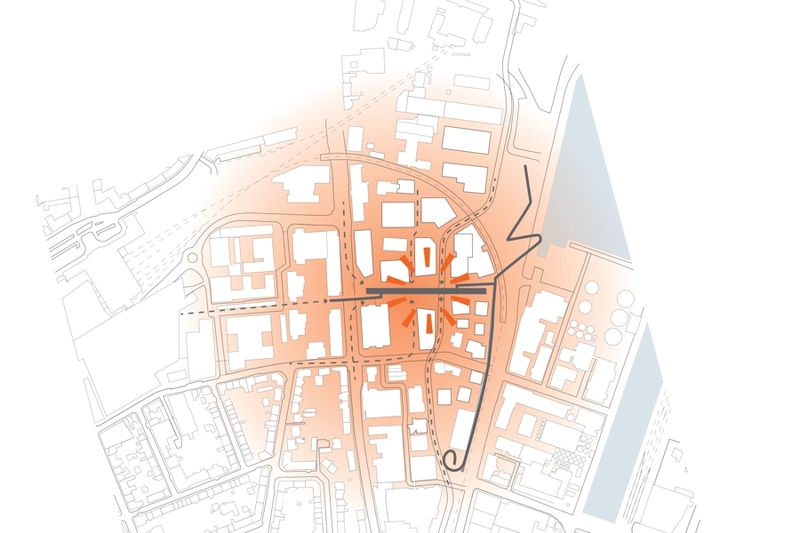 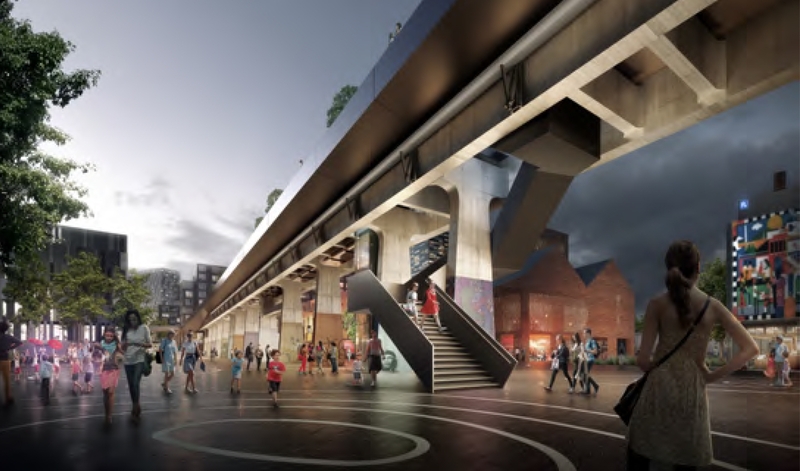 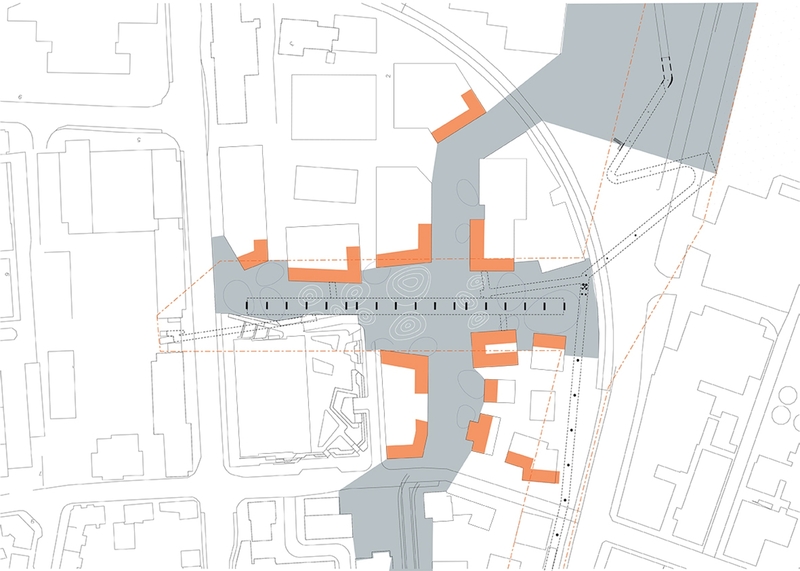 The site – wedged between a major cutting and a power plant – had serious challenges in terms of connectivity but also in the location and organisation of viable redevelopment sites. 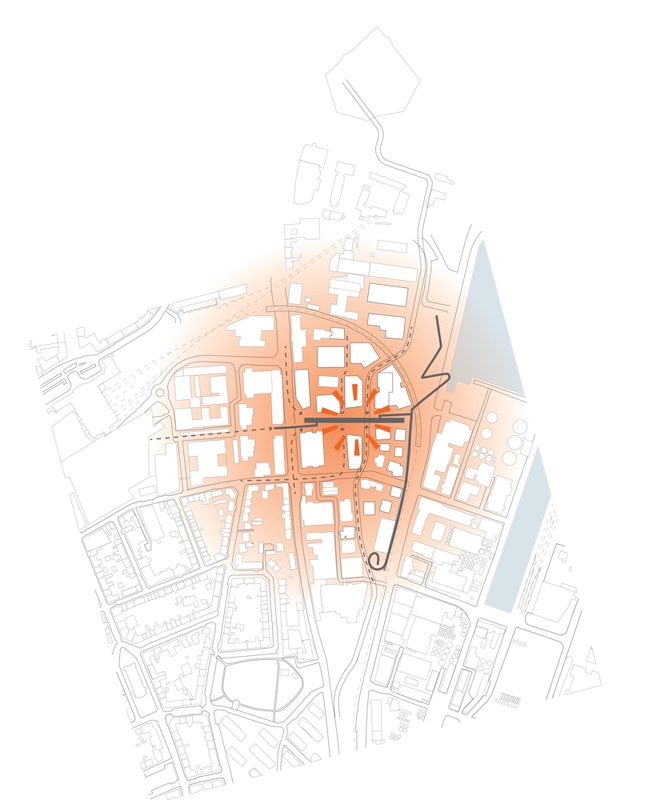 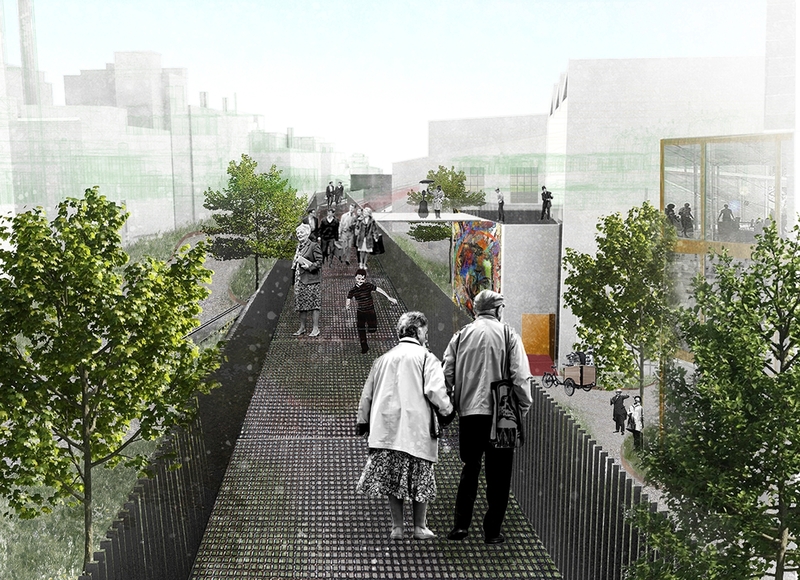 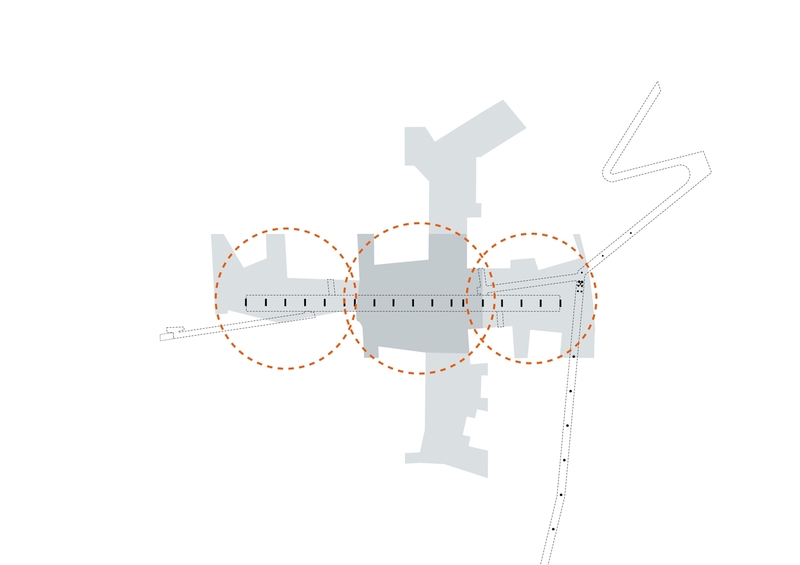 Our team’s strategy focused on understanding the bridge in the context of the reorganisation of the whole site, considering it in the larger context of the Aarhus coast to the south and north and how this slightly isolated but well-located precinct might contribute to the city as a whole. 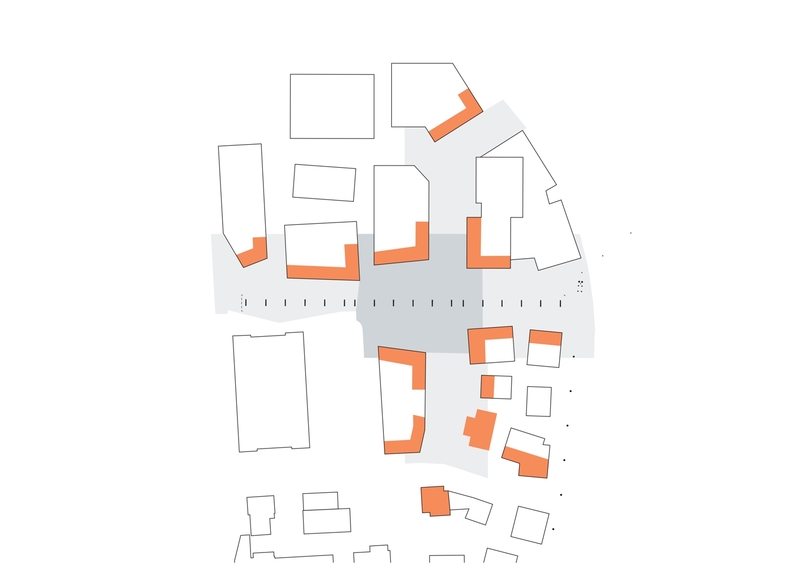 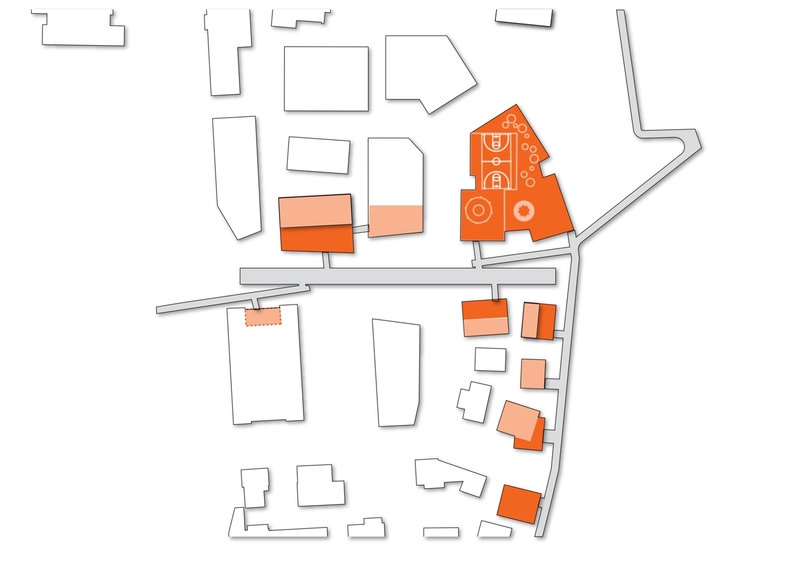 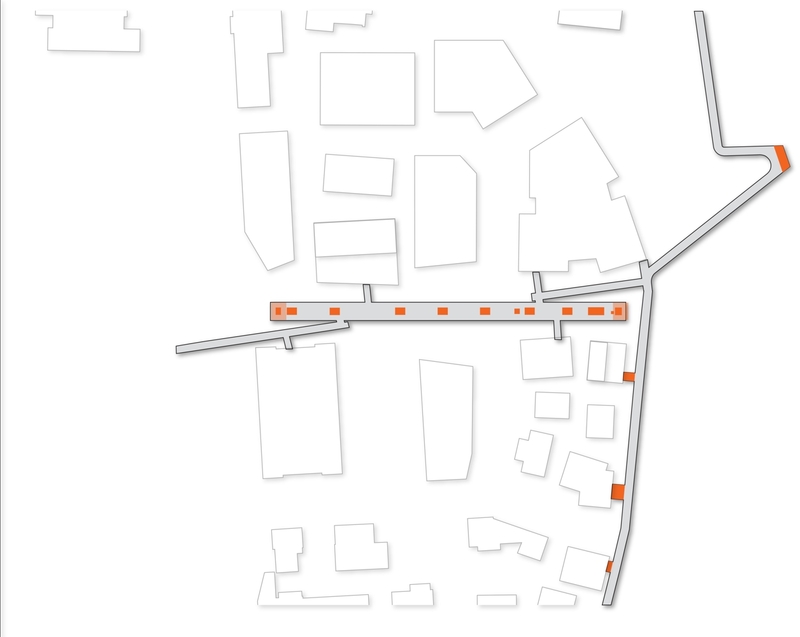 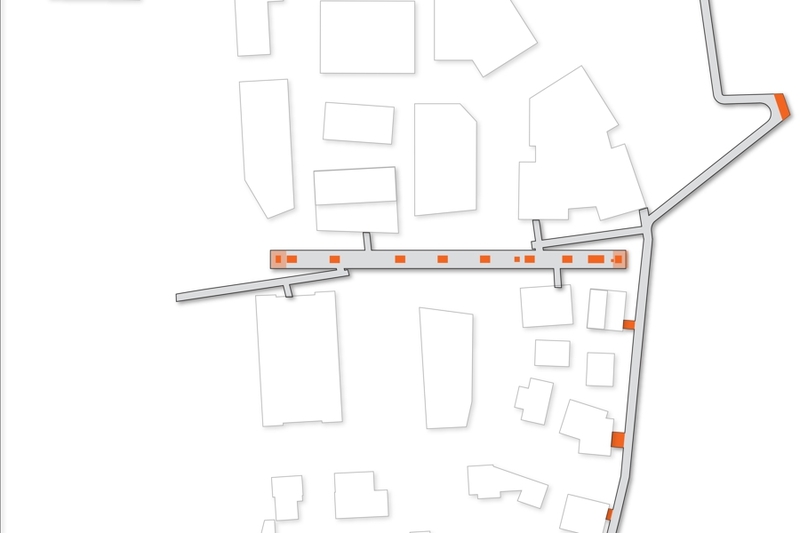 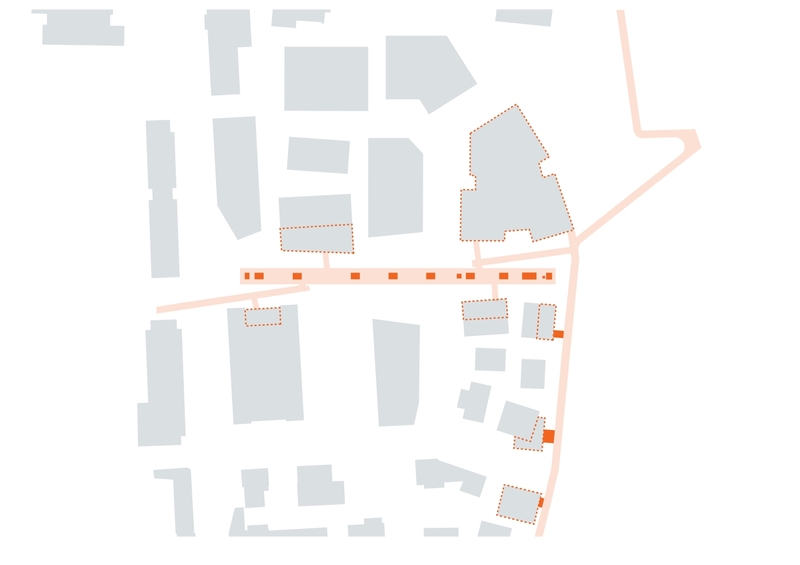 With key connectivity matters understood, we then worked with varying plot sizes to ensure diverse forms of occupation, including an attempt to make sense of a bank headquarters (building footprint, occupants, public domain constraints) in this neighbourhood. 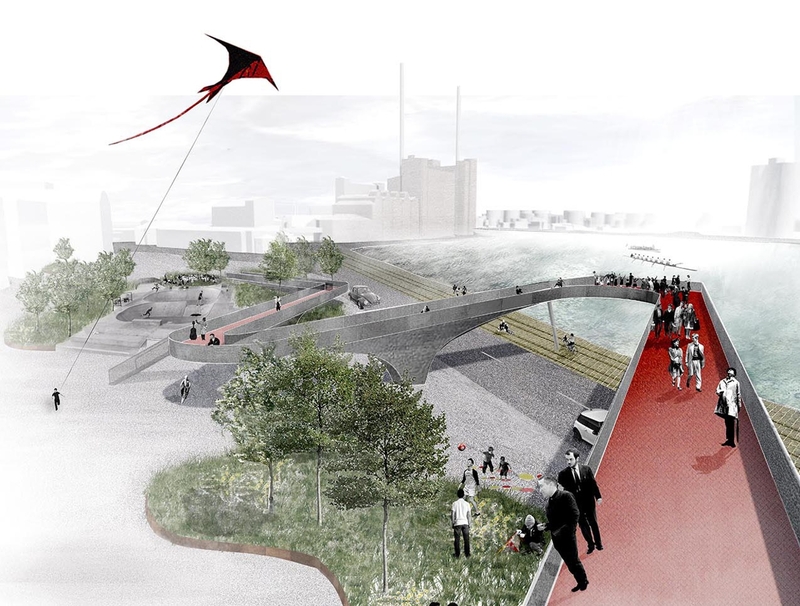 The bridge itself was addressed in three ways, all of which intended to increase the amount of public domain in what is to become a crowded and arguably over-developed area and also to increase the use of the bridge and surrounds. 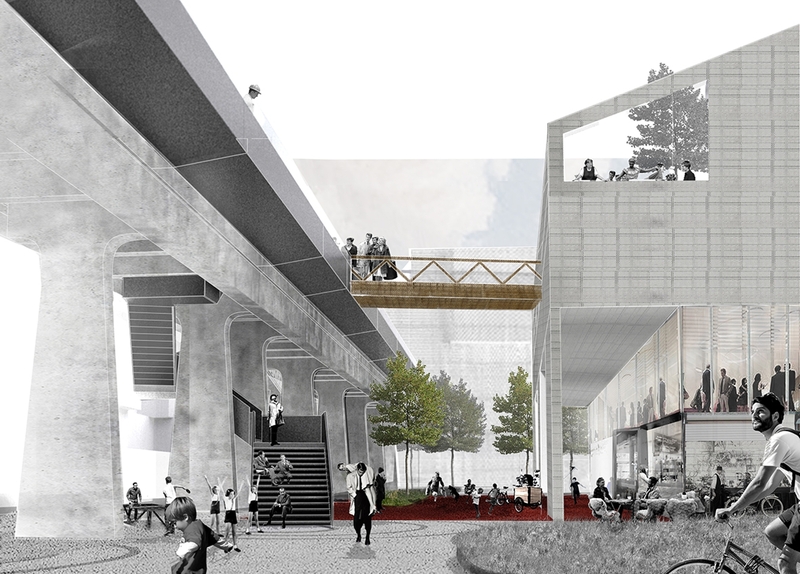 Firstly, the major site carpark was located at the far end of the bridge, adjacent to the main road. Secondly, the bridge itself was used as more than a circulation path, but was capped with a giant steel vessel, like a boat, that contained both planting and a greatly expanded width, more a piazette than a gallery. 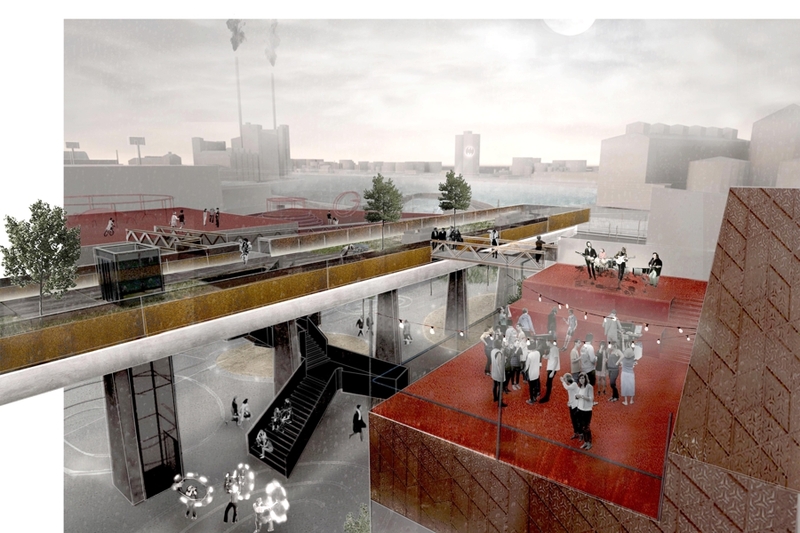 The extended width of the vessel then allowed the space below the bridge to be used as a covered area for events, while above, a garden in the sky would provide shelter for those crossing the site. 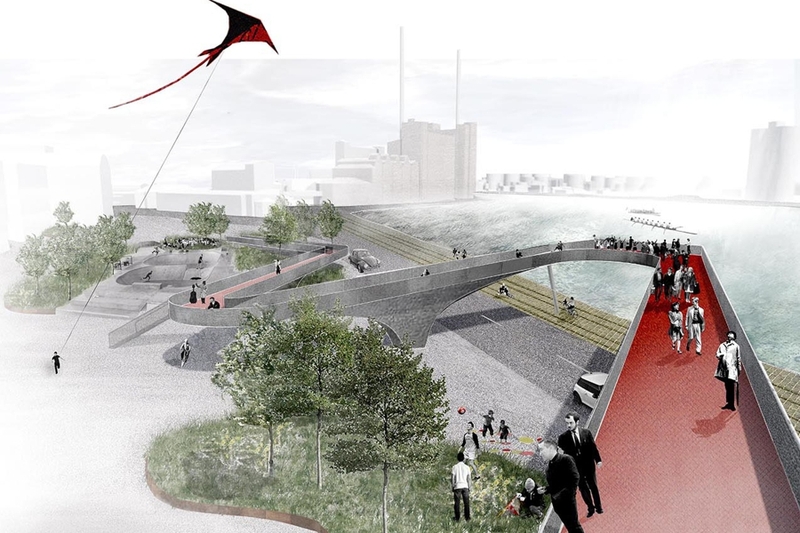 Finally, the importance of the bridge in historical terms led to its use as the organiser of a buffer zone around it, resulting in a large and robust public plaza that was intended to have a multitude of uses. 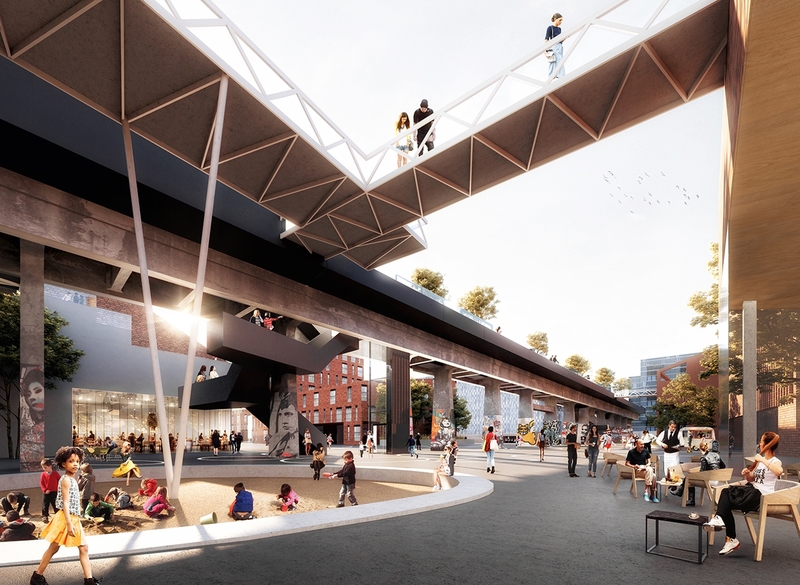 TERROIR er sammen med LATZ & Partner og ISC Rådgivende Ingeniører udvalgt som ét af to endelige hold – ud af seks tidligere - til den endelige fase af konkurrencen omkring Sydhavnen i Aarhus med fokus på Kulkransporet. 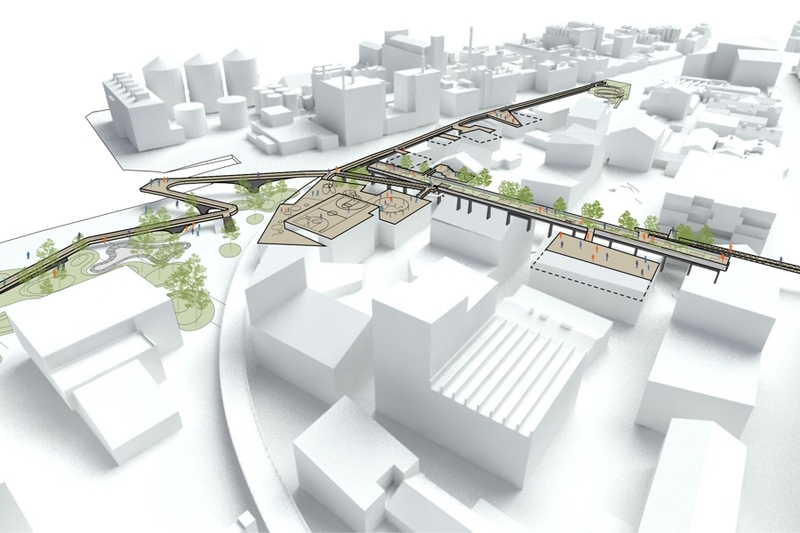 Projektet går forud for en revitalisering af hele det mangfoldige byområde, som rummer et nyt hovedkvarter til Danske Bank, Filmbyen, et miljø af små kreative virksomheder samt væresteder for byens hjemløse. 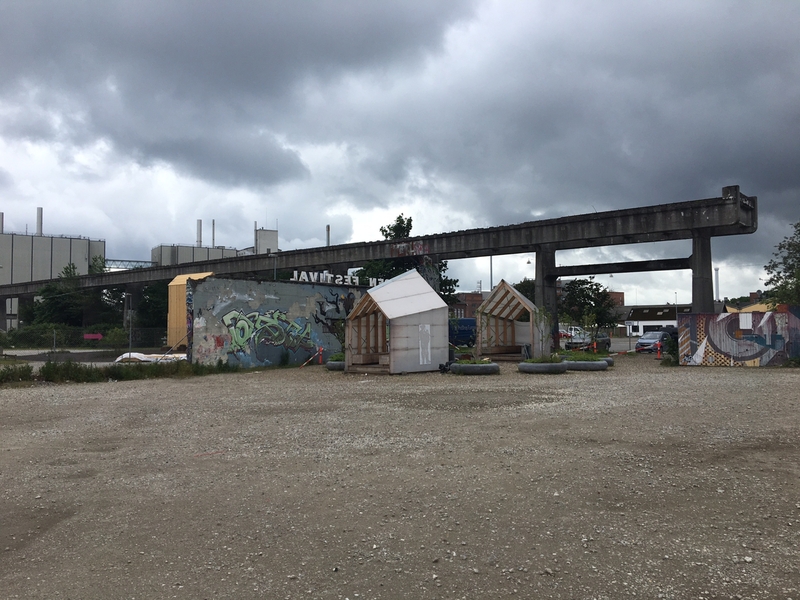 I den endelige fase konkurreres imod et team anført af TRANSFORM. 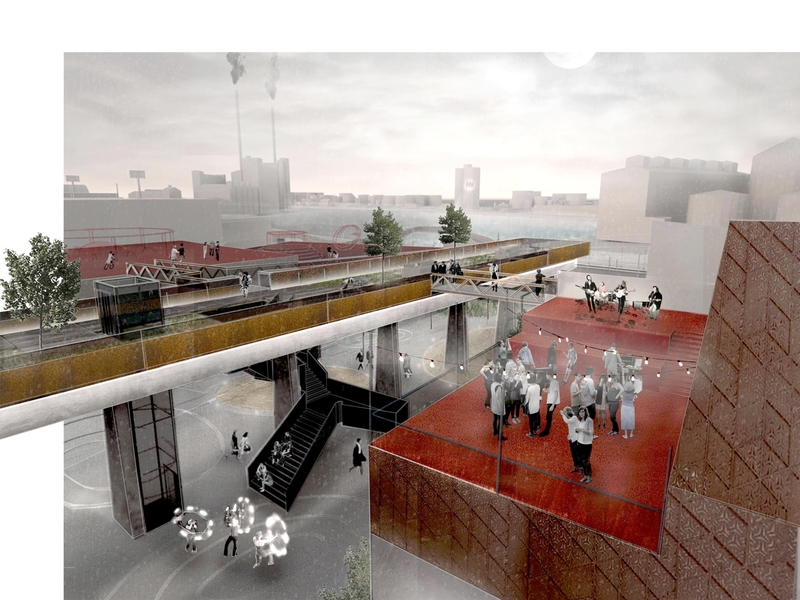 I første fase deltog i øvrigt SLA, MDRDV, Henning Larsen, Vandkunsten, Cubo m.fl.